Feathers look most effective when they don't look like feathers! We will teach you how to trim and style all types of feathers as well as how to "burn" an ostrich feather to give it that light, cobweb look. We will teach you how to bind and wire your feathers, and, how to secure them to your headpiece. 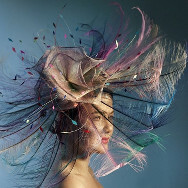 This workshop is an absolute must for new milliners. Feathers! As many types as you have. All the tools you will need: dolly heads, curling tongs, irons, wire cutters, pliers, sewing needles, thread, scissors, sewing machines, blocks, etc. Any of the workshop materials will be available for purchase should you need them. Let us know in advance if possible. Learn how to handle and treat feathers to make fabulously effective trims.